My life, under the microscope...: Holy metallic mammal, Batman! Well, this morning started off pretty interesting! I got to State Fair (which is now done, I hadn't been there since Saturday) around 7:15 this morning to pick up my birds, and the lady in charge of the building said "I have a surprise for you." I was thinking "oh no, she's sending me home with a bunch of chicks or something." Turns out that for some reason the coop cards had been mislabeled during judging. So it was not the White Call Duck that won Best in Show, it was the Black Rosecomb. MY Black Rosecomb!!! Wow!!! Victory Dance!!! 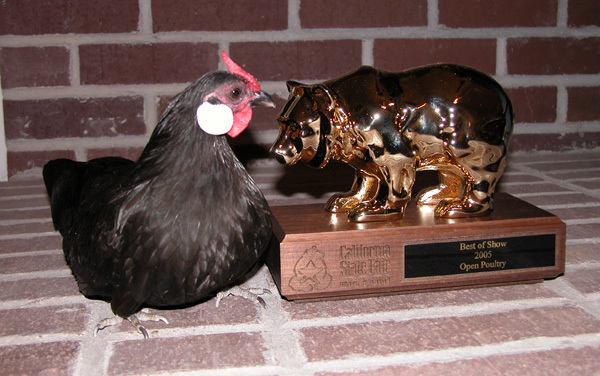 :-) I'm totally thrilled, this is my first ever Best in Show at State Fair, the first golden bear I've won with a chicken (I have others from other competitions). I do feel bad for the owner of the duck... He took it pretty well though...no doubt better than I would have. I gotta say these bears have changed over the years. They must have been on a diet. Although the same size as the old ones (I last won one in 1997) the old bears are a meaty 6 pounds and the new bears are a svelte 3.5 pounds. Hmmm.